The survey asked Muslims about their views on various dimensions of contemporary life. 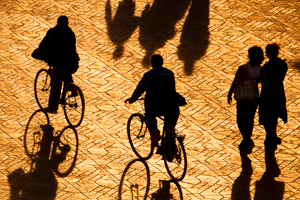 Muslims see few tensions between their faith and life in the modern world. Most think it is possible to be a devout Muslim and still live in a modern society, and many also dismiss the idea that there is an inherent antagonism between religion and science. Indeed, most Muslims say they believe in evolution. But Western and Indian popular culture imports elicit mixed reactions from the world’s Muslims. While many Muslims say they personally like Western music, movies and television, most Muslims also agree that Western popular culture has hurt morality in their countries. On balance, more Muslims say they like Bollywood movies and music than say the same about Western entertainment. Muslims also see Bollywood as less harmful to morality than Western popular culture is. Muslims in most regions surveyed say being a religious person is compatible with life in modern society. In sub-Saharan Africa, however, Muslims in many countries are divided on this issue. Muslims in Southeast Asia, Central Asia, and Southern and Eastern Europe tend to be the least likely to see a conflict between being devout and living in the contemporary world. In Southeast Asia, for instance, fewer than a third of Muslims in Thailand (32%), Malaysia (23%) and Indonesia (21%) say religion and modernity are at odds. In Central Asia as well as Southern and Eastern Europe, no more than four-in-ten Muslims say religion and modernity are incompatible, including just 13% of Azerbaijani Muslims. Of the populations surveyed in these regions, Turkish Muslims are the most closely divided on the issue: 38% say there is a conflict between religion and modern life, while 49% disagree. In most countries surveyed in South Asia and the Middle East-North Africa region, fewer than a third of Muslims say there is a conflict between being devout and leading a modern life. But Muslims are more divided on this question in Tunisia (50% say there is a conflict, 46% say there is not), Lebanon (45% vs. 51%) and Bangladesh (55% vs. 39%). Across the six major regions included in the study, Muslims in sub-Saharan Africa are among the most likely to say religious devotion and modern life are incompatible. In 14 of the 16 countries surveyed in the region, at least three-in-ten say there is a conflict, including a majority in Chad (59%) and Kenya (54%). Muslims who pray several times a day are no more likely than those who pray less often to say that religion and modernity are in conflict. In addition, age, gender and education have little impact on whether Muslims see a tension between being a religious person and living in contemporary society. Most Muslims do not believe there is an inherent tension between religion and science. In just two of the 23 countries where the question was asked do more than half of Muslims say there is a conflict between faith and science. In fact, at least half of Muslims in 17 countries say no conflict exists. Muslims in the Middle East and North Africa are among the least likely to believe there is a conflict between science and religion. Fewer than one-in-five express this view in Morocco (18%), Egypt (16%), Iraq (15%), Jordan (15%) and the Palestinian territories (14%). However, a higher percentage of Muslims in Lebanon (53%) and Tunisia (42%) say there is a conflict. In the Southeast Asian countries surveyed, fewer than a third of Muslims say there is a tension between religion and science. Similarly, in Central Asia, relatively few Muslims see a conflict, including just 19% in Azerbaijan and 18% in Uzbekistan. However, Muslims in Turkey are divided on this question (40% say there is a conflict, 44% disagree). In the South Asian countries surveyed, Muslims’ opinions about the compatibility of science and religion differ considerably. By a 57%-to-29% margin, most Afghan Muslims say there is no inherent tension between faith and science. By comparison, Muslims in Bangladesh are evenly divided over the issue (with 45% on each side). Pakistani Muslims are less certain: 27% say there is a tension between science and religion, 33% say there is not, and 41% say they do not know. Across the nations surveyed in Southern and Eastern Europe, more than a quarter of Muslims in each country believes there is an inherent tension between faith and science, including 57% in Albania. Nonetheless, about half of Muslims in Bosnia-Herzegovina (50%), Russia (50%) and Kosovo (49%) believe there is no conflict. There are not significant differences on this question by frequency of prayer, gender, age or education. Many Muslims around the world believe in evolution. In 13 of the 22 countries where the question was asked, at least half say humans and other living things have evolved over time. By contrast, in just four countries do at least half say that humans have remained in their present form since the beginning of time. In Southern and Eastern Europe, a majority of Muslims in Albania (62%) and Russia (58%) believe in evolution. But Muslims are divided in Bosnia-Herzegovina (50% believe humans have evolved, while 45% take the opposite view) and Kosovo (34% vs. 40%). In four of the Central Asian countries surveyed, more than half of Muslims say they believe in evolution, including nearly eight-in-ten in Kazakhstan (79%). In Tajikistan and Turkey, by contrast, the predominant view is that humans have remained in their present form since the beginning of time (55% and 49%, respectively). At least six-in-ten Muslims in Lebanon (78%), the Palestinian territories (67%) and Morocco (63%) think humans and other living things have evolved over time, but Jordanian and Tunisian Muslims are more divided on the issue. About half in Jordan (52%) believe in evolution, while 47% say humans have always existed in their present form. And in Tunisia, 45% say humans have evolved, 36% say they have always existed in their present form, and 19% are unsure. Iraq is the only country surveyed in the Middle East-North Africa region where a majority rejects the theory of evolution (67%). Muslims’ views on evolution vary in South Asia and Southeast Asia. Muslims in Thailand (55%) and Bangladesh (54%) tend to accept that humans have evolved over time. But Muslims in Malaysia and Pakistan are divided: roughly four-in-ten Malaysian Muslims (37%) believe in evolution, while 45% say humans have always existed in their present form. In Pakistan, 30% think humans have evolved, while 38% disagree and 32% say that they do not know. In Afghanistan and Indonesia, the prevailing view is that humans and living things have remained in their present form since the beginning of time (62% and 55%, respectively). In 18 of the 38 countries where data are available, at least half of Muslims say they like Western music, movies and television. However, in a number of countries views of Western entertainment are mixed. Muslims in Southern and Eastern Europe are especially likely to say they enjoy Western popular culture. More than six-in-ten in Albania (77%), Kosovo (69%) and Bosnia-Herzegovina (62%) like Western entertainment. About half of Muslims in Russia (52%) say the same. Central Asian Muslims are mixed in their views of Western cultural exports. More than half of Muslims in Tajikistan (57%), Kazakhstan (56%) and Azerbaijan (55%) say they like Western popular culture, but fewer say the same in Turkey (49%), Kyrgyzstan (45%) and Uzbekistan (38%). In sub-Saharan Africa, Muslims also have divided opinions over Western entertainment. Preference for Western music, movies and television ranges from 71% in Guinea Bissau to 29% in Ethiopia. Fewer Muslims in Southeast Asia enjoy Western popular culture. While half of Malaysian Muslims like Western entertainment, just 41% of Indonesian Muslims and 22% of Thai Muslims hold this opinion. Similarly, fewer than half of Muslims in most countries surveyed in the Middle East and North Africa say they like Western entertainment. The one exception is Morocco (52%). Muslims in South Asia are among the least likely to enjoy Western cultural exports. Just three-in-ten or fewer Muslims in the countries surveyed in the region have a favorable opinion of Western music, movies and television, including just 20% in Pakistan. Muslims who pray several times a day are less likely than those who pray less frequently to say they enjoy Western entertainment. The gap is especially large in the Middle East and North Africa, including in Tunisia (-32 percentage points), the Palestinian territories (-30), Morocco (-29), Iraq (-19) and Jordan (-19). Muslims ages 35 and older are less likely than younger Muslims to enjoy Western music, movies and television. The gap between generations is particularly wide in Russia (-37 percentage points), Malaysia (-35), Kyrgyzstan (-32) and Kazakhstan (-32). Bollywood cultural exports – music and movies from India – are broadly popular in Central Asia, where at least half of Muslims in all the countries surveyed say they enjoy this type of entertainment. But fewer than half of Muslims surveyed in South Asian countries agree. On balance, Bollywood is more popular than Western entertainment. Muslims are more likely to say they enjoy Bollywood than to say the same about Western entertainment in Uzbekistan (+21 percentage points), Bangladesh (+15), Azerbaijan (+10) and Tajikistan (+9). Although many Muslims around the globe say they personally like Western music, movies and television, at least half in the majority of countries surveyed believe Western popular culture harms morality in their country. In nearly every country surveyed in South Asia, Southeast Asia, the Middle East and North Africa, and sub-Saharan Africa, a majority of Muslims say Western entertainment is bad for their society, including at least eight-in-ten in Pakistan (88%), the Palestinian territories (81%), Tanzania (80%) and Uganda (80%). Guinea Bissau is the only country in these four regions where fewer than half (47%) believe Western cultural exports are harmful. In Central Asia, a majority of Muslims in Uzbekistan (81%) and Kyrgyzstan (69%) believe Western popular culture has a negative effect on morality, but fewer hold this view in Azerbaijan (52%), Tajikistan (51%), Turkey (50%) and Kazakhstan (50%). Muslims in Southern and Eastern Europe are among the least negative in their assessment of Western entertainment. Fewer than half of Muslims in Bosnia-Herzegovina (46%), Kosovo (44%) and Albania (40%) have negative views. Russia is the only country surveyed in the region where a majority of Muslims (58%) say Western entertainment is harmful. Muslims who pray several times a day are more likely than those who pray less often to say Western entertainment is harmful to their society. The gap is particularly wide in Malaysia (+27 percentage points), Tunisia (+27), Iraq (+25), Bosnia-Herzegovina (+24), Kosovo (+21), Russia (+21) and Jordan (+20). Older Muslims also are more likely than those younger than 35 to say that Western entertainment hurts morality. The age differences are particularly large in Kazakhstan (+22 percentage points), Azerbaijan (+20), Iraq (+19) and Jordan (+17). In contrast to their views on the impact of Western popular culture, Muslims disagree over Bollywood’s effect on morality in their country. In the South Asian countries surveyed, more than six-in-ten Muslims say Bollywood is bad for their society, including 88% of Muslims in Pakistan. In the Central Asian countries surveyed, by contrast, fewer than half say this. In most countries where the question was asked, fewer Muslims say Bollywood music and movies are harmful to morality than say the same about Western entertainment. This is especially true in Central Asia. For example, 50% of Kazakhstani Muslims say that Western popular culture hurts morality, compared with 13% who say the same about Bollywood. Large differences are also found in Kyrgyzstan (-36 percentage points), Uzbekistan (-35), Azerbaijan (-33) and Tajikistan (-23).